Lasagne is layered with pre-cooked chicken fillets and a ready-made sauce in this easy weekday supper. Preheat the oven to 200ºC, gas mark 6. Place the spinach in a colander over the sink, then pour over a kettle of boiling water to wilt it. Leave to cool then squeeze out all the moisture with your hands. Chop roughly and set aside. 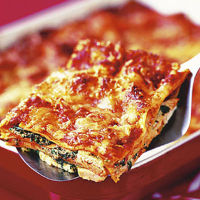 Scatter the base of a baking tin or lasagne dish with half the chicken slices, top with half the ricotta, spinach and pesto mixture, and layer with 4 lasagne sheets. Pour over a third of the tomato sauce, sprinkle with a third of the mozzarella, then add the remaining chicken and the ricotta mixture. Top with 4 more lasagne sheets. Repeat with more tomato, lasagne and mozzarella. Top with the rest of the tomato, and sprinkle with the last of the mozzarella and Parmigiano. Place in the oven for 30-35 minutes until bubbling and golden. Serve with green salad leaves such as Waitrose Mixed Leaf Crispy Salad. The lasagne can be assembled up to 24 hours ahead. Replace the fresh pasta with dried lasagne sheets, if you prefer. To save time, substitute defrosted frozen chopped spinach for fresh.